Insanity Alert burst onto the scene in in March of 2012 with their debut EP the masterful First Diagnosis, then in February 2013 they put out their second EP, a slightly weaker Second Opinion. Now as much I loved the second EP I was afraid the slightly more serious and even slowed down vibes of Second Opinion might plague the bands debut record. I am happy to report they have not. In fact the ten new tracks (Which are accompanied by 5 re-recorded pieces from the EP's) show the band on top of their game, cracking skulls and taking names. The things that make Insanity Alert special are their sense of humor and magnificent songwriting. In some cases I might even go so far as to say that they are more Municipal Waste than Municipal Waste themselves. Tracks like Macaroni Maniac show that the band still have what it takes to rock and understand what makes them so distinct and special. The rapid fire delivery of the vocal lines along with tight guitar riffs is not something that you easily forget. When it's paired with memorable choruses and ripping solos that are a blast to listen too you have a record that embodies all that makes thrash metal great. 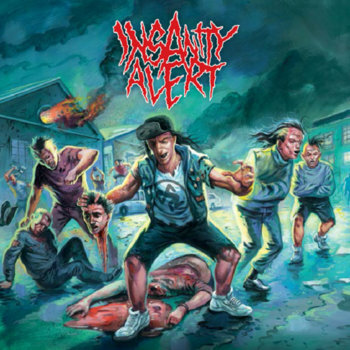 Insanity Alert is an album that will grab your attention right away and keep you moshing for hours on end. These songs are infinitely replayable. My iTunes informs me I have listened to their two first EP's upwards of 20 times and the songs on Insanity Alert are even better. Short and sweet this album gets to the spirit of thrash metal and makes you want to dance until your legs fall off. These guys can do something truly special and I think that this may very well be the best thrash metal record of 2014. So turn it all the way up and let the thrash take control.